Fort Process is a new one-day sound art festival exploring the unique acoustic spaces of Newhaven Fort on the Sussex coast. Taking place on September 13, the event will feature a packed line-up of the experimental and avant-garde, including headlining performances from free jazz legends Peter Brötzmann and Steve Noble, plus The Artaud Beats, featuring Chris Cutler and other members of 'rock in opposition' pioneers Henry Cow. Away from the main stage, site-specific performances in the tunnels and bunkers of the 19th century fort will feature such names as kinetic sculptor Max Eastley, musician and inventor Sarah Angliss, Quietus favourites English Heretic and electronic composer Thomas Köner, with many artists performing specially commissioned pieces. Promising "cave noise, free jazz sunshine, abstract chamber dungeons and more", Fort Process sets out to draw together sound expressions from many different disciplines, and to present them in settings dictated by Newhaven Fort's unique acoustic environment. "It's not led by the performers or the organisers," insists Graham Newbury, of locally-based promoters Lost Property. "It's led by, and dictated by, the space." "As far as possible we've tried to make it so the performers are doing it specifically for the space they're in, so they're incorporating that into their sets," adds sound art curator and performer Joshua Legallienne. "So for instance, Blood Stereo are going to be doing site-specific recordings and then integrating those into their performances on the day. And there'll be a whole number of people who'll be doing things like that." The event will also feature talks and readings curated by Alastair Kemp of Newhaven's own Eleusinian Press, an independent local publisher dedicated to "giving a platform to voices outside of the norm". Kemp publishes the Newhaven Journeyman, a journal focussing on "shared practices between music, mental health and radical politics" and Eleusian Press has published novels, autobiographies and poetry collections by writers around the world, largely dealing with similar themes; their current schedule also includes a biography of the Clash's Mick Jones and a book on queer music events organisation and activism in music. The spoken word programme at the fort includes talks on occult sound art, circuit bending, feminism and music performance, and psychogeographic explorations from occult beachcomber The Haunted Shoreline ("Hermes Trismegistus and C.G. Jung chase giant psychedelic beach balls across fossil-strewn cliffs, while George Batailles performs unspeakable perversions with Max Ernst's frottage sticks and a giant squid"). Inspired by the practice of psychogeography and local folklore, Kemp was in fact the initiator of Fort Process, after "walking round the edgelands of Newhaven" as a means of therapy following the birth of his severely ill daughter. The process of "a community reacquainting themselves with their own town" seemed linked to self-care practices and the notion of free improvisation in music as a way of rooting oneself collectively in the world. 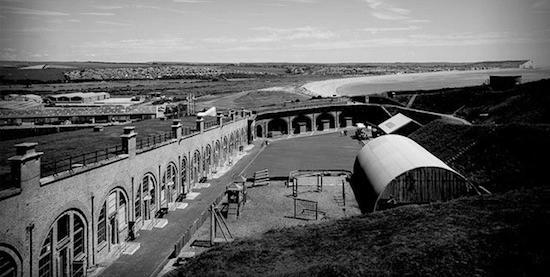 He was made aware of the unique architectural and acoustic qualities of Newhaven Fort after holding a launch for the first Newhaven Journeyman in one of the rooms there, and contacted experimental music promoters he knew in Brighton with the idea of organising a festival. Fort Process will also include a full programme of contemporary classical music, expanding on last year's hugely successful Cage Without Silence events. John Cage and Alvin Lucier will be the featured composers, while renowned modern composer Michael Finnissy has written a specially commissioned piece that will be performed as the festival's opening set. "That will be quite loud on the outside stage," Graham Newbury explains. "And then we'll go into the sound art stuff, with quiet performances all over the site and in the tunnels. It's not going to be staggered; it's go in and see what you can. "Then the idea is, about five or six, to change the nature of the whole thing with an outside performance that will get everyone outside, and then it'll become a gig on the outside stage effectively. Maybe a couple of stages still running for people to escape to if they don't want to watch that; but essentially it'll be a quieter thing during the day and then it'll change to a louder thing in the evening." That "louder thing" will culminate in a much-anticipated performance by seminal free jazz saxophonist Peter Brötzmann, whose 1968 album Machine Gun is still regarded as one of the most important and ground-breaking releases in the genre. Brötzmann's previous collaborators have included Derek Bailey, Bill Laswell and John Zorn; at the Fort he will be joined by drummer Steve Noble, a stalwart of the European jazz and improvised music scene since the early 1980s. Other names so far confirmed for the festival include Roshi featuring Pars Radio, Plurals, John Butcher, Embla Quickbeam, Part Wild Horses Mane On Both Sides, Poulomi Desai, Timothy Didymus, Philippe Petit and Aqua Dentata, with the brilliant Innerstrings Lightshow providing old-school analogue psychedelic projections that will illuminate the fort. Warm-up events are planned in Brighton, London and Newhaven, while the local Tideway school are also involved, with activities including workshops sound walks and "hidden histories." "All of the sound art will be happening within the Eastern Magazine, and that's a subterranean bunker that leads to a caponier which is jutting out into the cliffs," says Joshua Legallienne. "We've got a lot of installation work and site-specific performances that are going to be working with the topography and acoustics of the fort. Max Eastley is the biggest artist that we've got on board; he's doing a site-specific piece that we're commissioning specifically for the fort. We've also got Zimoun, a Swiss artist; he's going to be working with filament wire and DC motors, and that's going to be interacting with one of the specific rooms in the magazine. We've also got an artist called David Stern, who's going to be doing a piece with ghost boxes. It's a transmission-based piece, hopefully picking up on some paranormal activity in the fort. We're going to do a test run of that before the day." Although promoters Lost Property are a new company, collectively they have many years of experience promoting experimental and underground music and culture around Brighton and southern England. These have included the Colour Out Of Space and Occulture festivals, as well as innumerable shows under such banners as Spirit Of Gravity, Club Zygotic, Bang The Bore, Safehouse and At The Coach House. Their first venture was the Church Of Chaos tent at last year's Supernormal, which successfully presented a continuous programme of eclectic and improvised music over three days, and provided many of the left field festival's most extreme and out-there moments. If Fort Process is a success - and tickets for the 300-capacity event are already selling fast - then Lost Property hope to stage similar events elsewhere. "The idea is to take it around internationally," Graham says. "Or at least around England first of all, doing the same thing in spaces that are sonically interesting but maybe don't normally get used for that sort of stuff." Head to Fort Process' website for full details and tickets.